Some might ask, "Why Whispering Minds?" I firmly believe that all people are so much more than they appear to be. We behave differently in every setting and around different people. We are, of course, the sum of our experiences--the expectations put on us and the interactions that reinforced or deterred our natural inclinations. In short, we are chameleons within ourselves. 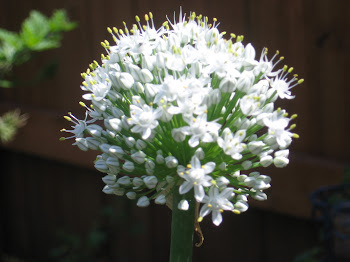 My onion bloom, for example, is made up of nearly a hundred tiny flowers. Each singular bud has a purpose and a place to fill. When combined, the effect is stunning--a cohesive flower that delights and intrigues. That, my friends, is our own human potential, wrapped up as the person you see, yet created by tiny details that first elude us. Which leads me to my YA writing. WHISPERING MINDS is also the title of my young adult novel. As a child advocate in the court systems with a psychology/social service background, I am intrigued by the human spirit, and never is it more malleable than during the very formative years of one's childhood. WHISPERING MINDS, both the blog and the book, is a place to explore ourselves.